Now in its 31st year of supporting Cancer Services at OhioHealth Riverside Methodist Hospital, Kitchen Kapers continues its mission to improve the lives of those living with cancer. Annually, our group of committed volunteers has raised funds through the popular Kitchen Kapers tour of newly remodeled gourmet kitchens in the Upper Arlington community. This year, our proceeds will reach even further. We will continue to fund the Artist in Residence program at Riverside Methodist, and we will also support the hospital's other integrative care offerings, such as acupuncture, art therapy, integrative physician consultation, massage therapy, cancer rehabilitation, mind-body therapies and nutrition counseling. Integrative care enhances patient healing and improves quality of life. 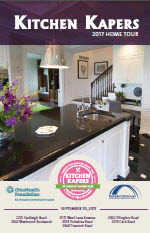 Kitchen Kapers hosts a home tour which supports cancer care at Riverside Methodist. Support our annual event by making a donation! Join us September 9, 2018 for a tour of exquisite kitchens in beautiful homes. Help support cancer care and help your business - become a 2018 Sponsor! Learn how your donation will be used to support Integrative Care for Riverside Methodist cancer patients. Please Join us for our 2018 tour! Gather ideas to inspire your own renovation, or simply enjoy the exquisite kitchens, beautiful flower arrangements from local florists and delicious foods provided by local restaurants all while supporting a worthy cause! Tickets are $30 ahead of time, $35 at the door, and can be purchased in advance of the tour online. They can be purchased on the day of the tour online or at the tour homes. This informational video was featured on the Coldwell Banker King Thompson Home Show on Sunday mornings on Channel 4. These seven beautiful homes will be featured on the 2018 tour. © Copyright 2019 Kitchen Kapers. All Rights Reserved.